The aluminum-bodied 1947 Norman Timbs Special attracted a lot of stares. Alternative materials are all the buzz as carmakers strive to take weight out of vehicles for better fuel economy. But they're not new. In the 1940s, a designer-engineer named Norman Timbs already was experimenting with aluminum and other materials, and was doing it beautifully. 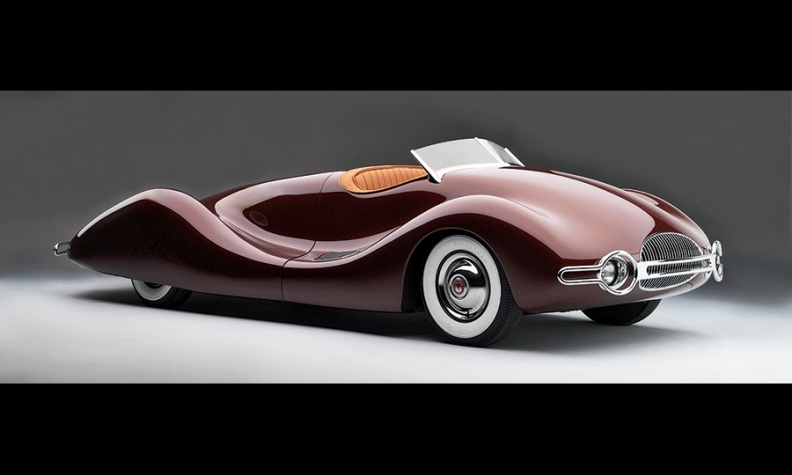 The dramatically streamlined, aluminum-bodied 1947 Norman Timbs Special is being shown at the Indianapolis Museum of Art's "Dream Cars" concept cars exhibit, which runs through Aug. 23. The titian red two-seater features a hand-built body that rests on a chrome-moly tubular frame. The chrome-moly tubes, 4 inches in diameter, "were capped at the ends and pressurized by a small air compressor, allegedly to help stiffen the frame and supply air for the air horns," according to Dream Cars, the coffee-table book accompanying the exhibition. Timbs was a mechanical engineer who had designed the legendary Blue Crown Special race cars driven at the Indianapolis 500 by Bill Holland and Mauri Rose. He also worked with Preston Tucker on the Tucker 48 Torpedo. It took Timbs three years to build the car, which is powered by a Buick straight-8 engine positioned behind the cozy passenger compartment. Timbs' son, Norman Timbs Jr., said his father was proud of his creation and drove it occasionally, according to Dream Cars. "But it was so futuristic looking, he couldn't drive it anywhere without people constantly stopping and staring at it. It happened so often, he got tired of it."